I’ve been interested in skin care products since I turned 40. If you’re in your 40’s, I’m pretty sure you understand that skin health is no longer something we can put aside. Not unless, of course, if we make it an option to just let skin trouble happen to us. I’ve been told more than once in my youth that my skin was my biggest asset. But when I turned 40, I started experiencing skin problems, not just on my face, but on other parts of my body, like eczema, skin tags, dry skin, age spots and for crying out loud, acne! 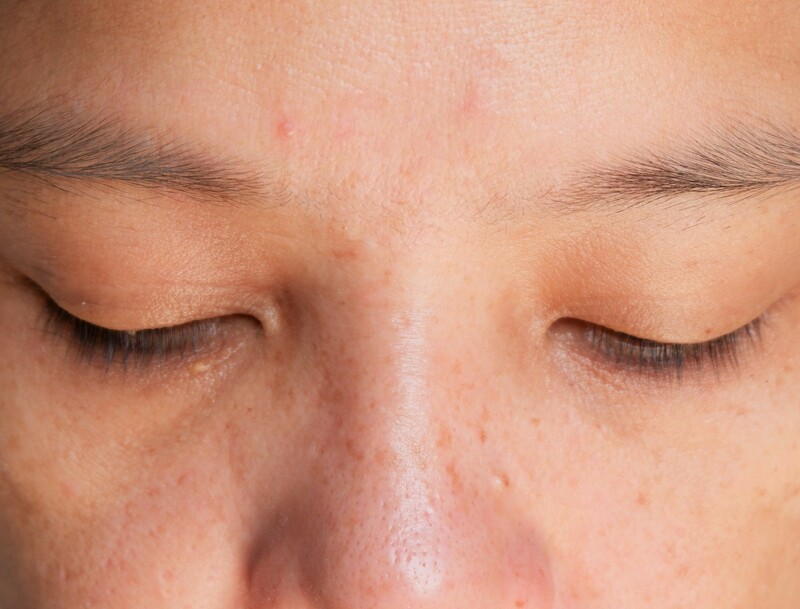 Acne at 40! I was never the one who liked makeup for everyday and enjoyed most of my younger days fresh-faced unless I was going to be onstage to perform. But now, even with makeup on, I don’t feel as confident with my skin as I had been. Not when I have some questionable dry skin on my feet bone and my fingers, and dark spots that seem to become bigger as days come. I’m pretty open to anything, really. I’ve tried a few skin care products but the results had been just okay. The best one I tried was just too expensive at PHP 3,000 for a box of gluta pills, and it still didn’t feel enough. When my friend from university, Jujie Bulos, asked me to try out her company’s products (when I say ”hers,” I mean she owns the dang thing and commissions local pharmas to formulate their products), MaxCEEmum, I said yes right away. If there’s anyone who knows skin care like the back of her hand, that’s her. I mean, have you seen her? Here, I’ll show you. That’s not makeup nor filter. You have to see her in person to know what I’m talking about. 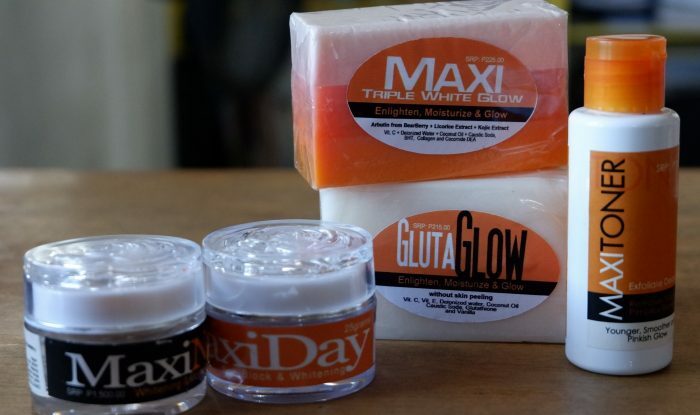 The skin care products I was sent were Gluta Glow and Maxi Triple White Glow, Maxi toner, Maxi Day and Maxi Night creams. I also received a pack of maxCeemum non-acidic Vitamin C and a bottle of MAXIGREENS containing 30 capsules, and a box of Maxi Kofi. I decided that I was going to try the products for two weeks before I give feedback. And I was going to use the products together to see if following a specific routine would glean the best results. I wash my face with Gluta Glow in the morning. Put a thin layer of Maxi Day. I’d take 1 capsule of Vitamin C and MAXIGREENS right after. At night before I sleep, i would do the same routine, except this time, instead of putting Maxi Day, I put Maxi Night. 1. I love Gluta Glow! I could immediately feel my face soften and smoothen right after I washed my face, and I felt the same wonderful feeling every morning of the trial period. It had the right amount of moisturizing effect and my face felt very clean. I’ve been advised before to slice my facial soaps because they usually run out fast when I don’t, but it’s not the same with this one. It’s been more than two weeks and I still have a lot left. 2. 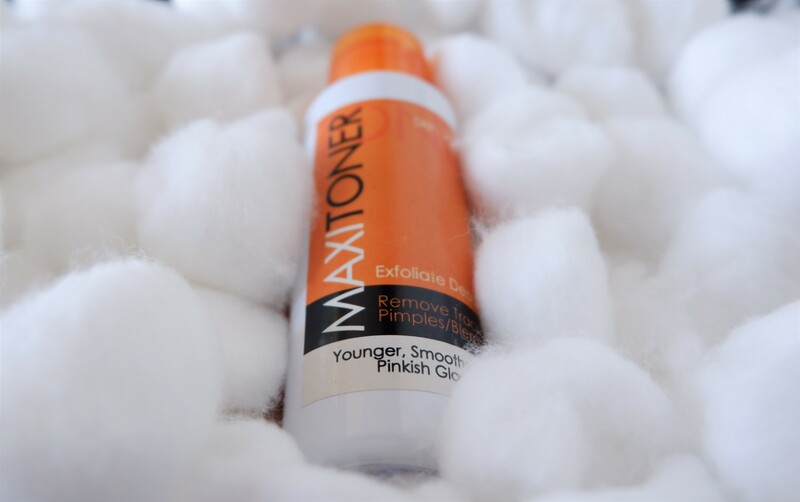 Maxi Toner exfoliates gently and lightly. It does not make you look like you’re on shedding season. I decided not to put on makeup on the first week because I wanted to see how my skin would develop with the products. My skin showed a bit of pink on its second week and I could feel a bit of sting from time to time, which I think is a sign that the skin has peeled. But from view, it doesn’t show. No one knows whats going on. When I started using it, I had some pimple marks on my chin, which disappeared gradually. However, two weeks of use wasn’t enough to stop the acne from occurring because I have one right now, but I think that the products are helping me manage it better. It’s not as horrifying as the previous one I had. Must be the Vitamin C in it. 3. Maxi Day smells lovely – and doesn’t make your face look or feel greasy. I’m not a scent expert so I can’t describe it to you, but the last thing anyone wants is to put on something that makes your face smell aged, you know what I mean? Maxi Day smells so good, it makes me want to put on a lot of it. Best part is that the skin absorbs it well and you end up with soft and smooth face. It doesn’t leave any greasiness at all. I felt so fresh using it. Really. According to the label, it has UVA and UV8 protection, but I tried not to go under direct sunlight just to be safe. It has whitening ingredients, so yes, I felt that some of my age spots lightened in all the two weeks I’ve tried it. My freckles are still there, but I like my freckles, hehe, so I’m not really in a rush to lose all of them. Just the age spots, thank you. 4. Maxi Night is even better! Maxi Night smells a bit like Chin Chun Su. I know because I used that cream before. It’s also not as creamy in texture as Maxi Day is, and spreading it is not as easy as Maxi Day which spreads like Ice Cream with my fingers. 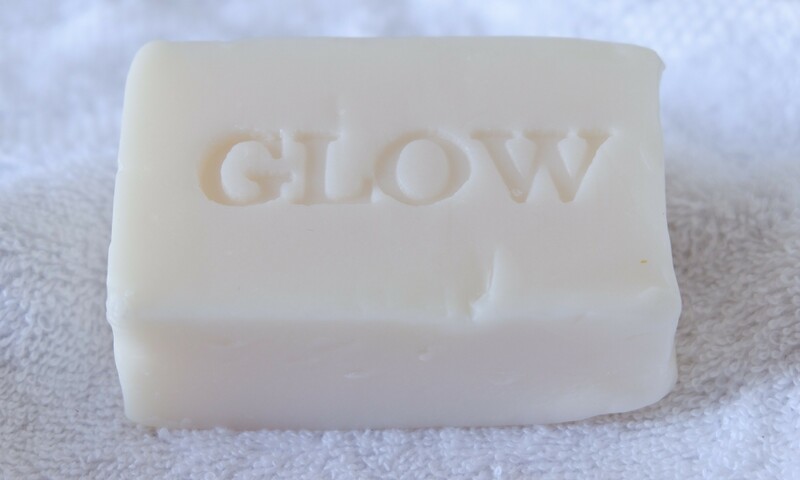 But you are going to love how it’s going to make your skin feel after a minute or so. Again, not greasy, and when you touch it, it’s soft and so supple, like a baby’s. But of course it doesn’t have sunscreen because it’s intended for bedtime. So don’t use it during the day because your skin won’t be protected from the sun. 5. Vitamin C is part of skin care. 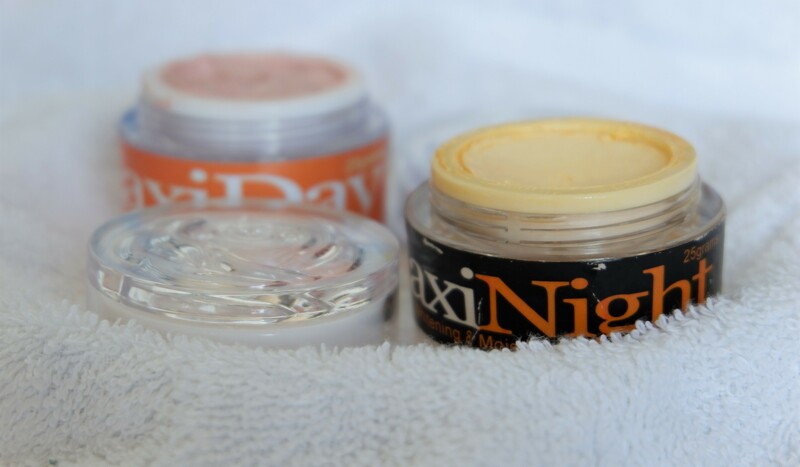 While using the topical skin care products, I was supplementing it with MaxCEEmum Vitamin C capsules. 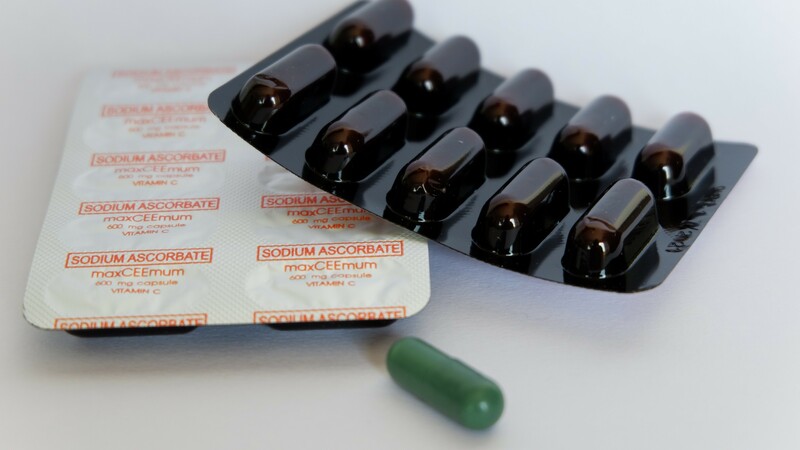 I started with one capsule a day on the first week, and took it twice everyday on the second week. I was a little hesitant at first because I heard that Vitamin C can be harmful to the kidneys if taken too much, but learned as I researched that it’s actually the ascorbic acid that causes that. MaxCEEmum Vitamin C is non-acidic which doesn’t harm the kidneys and helps prevent several conditions, including allergies, Anemia, Asthma, Arthritis, Auto-immune disorders, Constipation, Depression, Diabetes, Epilepsy, Fatigue, Fractures, Laryngitis, Meningococcemia, Psoriasis, Tuberculosis, Stress, Cardio diseases, Gallstones, Gingivities, Glaucoma….among many others. It is an anti-oxidant, immune booster, anti-obesity vitamin, anti-Cancer vitamin! The skin care products are great as they are, but I seriously think that taking the Vitamin C boosted its effects. I have two fingers that has allergies that won’t go away for years. But one of these fingers is completely healed! And I didn’t even use any of the products on it because the skin care line is for the face. That’s all Vitamin C effect! I also noticed that the acne scars on my face disappeared quick. The Vitamin C intake must have something to do with how fast the whole thing works. 6. 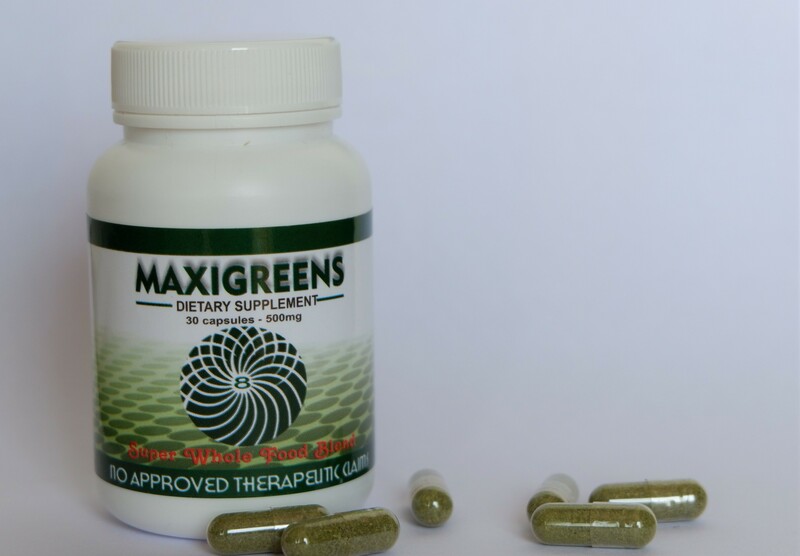 MAXIGREENS is good for the kidney and your liver. Along with MaxCEEmum Vitamin C, I also took MAXIGREENS. It is an 8-in-1 superfoods that contains Vitamins and Minerals. It cleanses the colon, the digestive tract, your kidneys, liver, blood, brain, heart, nerves, skin and bones! When you’re in your 40 and you have not thought of these when you were younger, you will now. I guess it’s part of growing up to be much more aware of how you care for your body. I wasn’t so sure about taking MAXIGREENS because it has barley in it and I’m trying to get into ketosis for weight loss, but I thought, whatever, I might as well, just to see how it goes for me. I don’t really know what it did for me, but I like what it stands for, so I just might continue taking it. After all, it also says it speeds up metabolism, so perhaps it will help me burn more calories when I exercise. MAXIKOFI, again, has Barley, but it has Stevia, so I decided to try it anyway. I stopped taking sugar and actually takes my coffee without it now. Not unless I hang out at coffee bean, then I take the No Sugar Added frappe alternatives. (NSA doesn’t necessarily mean sugar free). 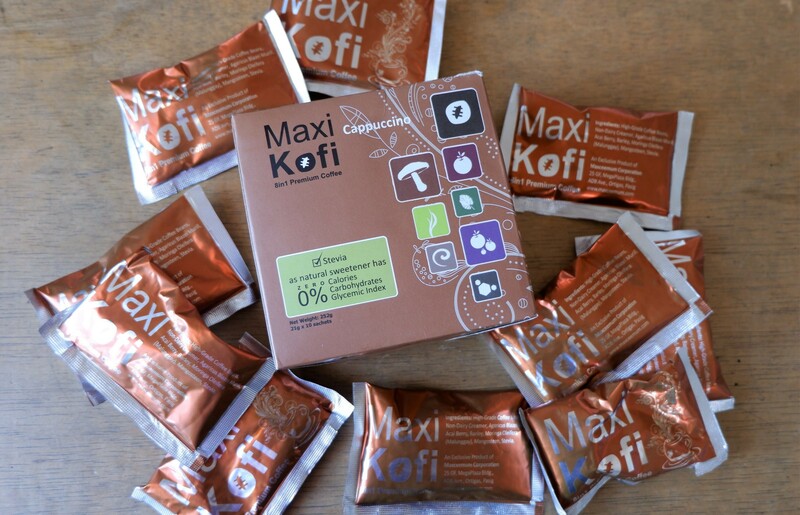 MAXIKOFI is said to have Acai Berry in it. Acai Berry is known to be effective for weight loss. I’m not sure if I lost any weight during the time I was drinking it with my husband, but it tasted okay to me. Jay liked it a lot, he finished it, haha! Anyway, it’s good for diabetics, not unless you’re on a Ketogenic diet. Let me just put it out right. MaxCEEmum is an multi-level marketing product or networking. To be able to purchase them, you need to apply for membership. 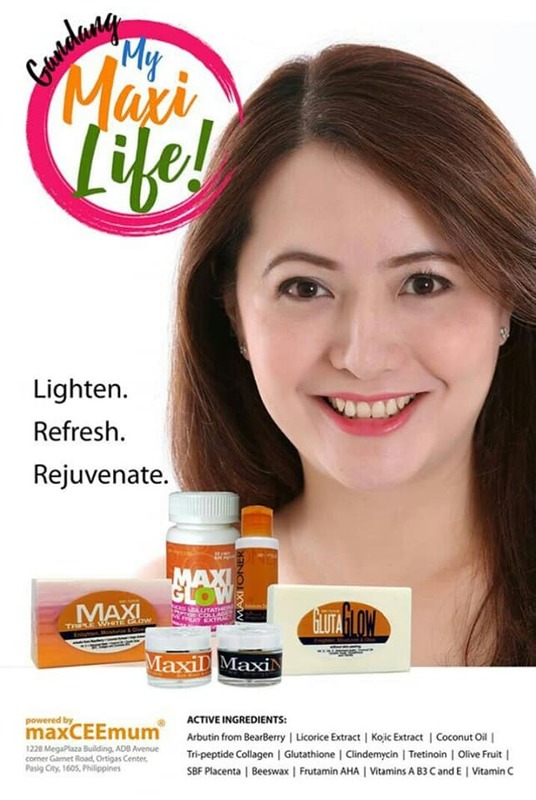 For only PHP 980, you can sign up for membership and receive a box of MaxCEEmum Vitamin C. Prices for the products are on the captions of the pictures. You don’t have to sell. You can simply sign up for membership so you can avail of the products. They’re priced a little higher than the usual local products, but the results will speak for that. If you can earn from recommendations, why not, right? According to Jujie, all of these products are safe for pregnant and breastfeeding moms and recommended for ages 16 and above. Plus, one interesting thing to know about MaxCEEmum is that it’s an all-Filipino product. From the suppliers, to the pharmas, right down to the company and staff. All Pinoy. You’ll be supporting local through MaxCEEmum. To sign up and purchase, contact MaxCEEmum at (02) 576 3286 or visit their official Facebook page. The product seems working on you. Not yet in my 40’s but yes we need to take care of our skin. I think I need a day and night cream. I’m almost 30 and I’ve been having eczema. Huhu. I might have to try these products. Increase intake of non-acidic Vitamin C lang sis. Interesting products. Yeah taking care of our skin is a must coz its the thing that is being with us forever. Wish to know the result after 3months of continous usage. Not a big fan of mlms, but I find some of their products really useful, though a bit pricey. On the other side, I’m a huge fan of Vitamin C, and I even bought the Nivea 50x vitamin C serum. That’s why I would love to try these products one day. Is this brand good for men too? 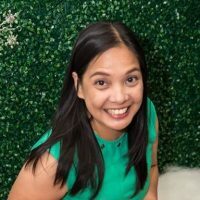 Halos karamihan sa mga skin care product sa market for girls only so paano naman kaming mga boys na gusto din alagaan ang mga balat namin pag nasa 40 na din kami. May I also know if the soap is better than the other famous whitening soaps like Kojic? Wow! It looks very effective on you. 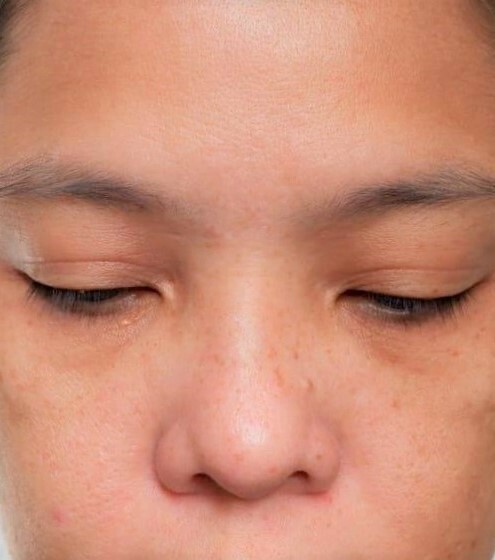 Nagbloom ka talaga after using the products. I guess I need to take Vitamins too for a healthier skin. Vitamin C is very important to our body. It gives wonders! Just heard about the product now. Hoping I can try that one day. It’s a little pricey though. I am currently struggling to look for a rejuv items, I will try this one and hoping my skin will be good with this. All-around ba yung effect nung products? Okay din ba yung product sa mga girls with sensitive skin? As a woman over 40, I agree that skincare and good health becomes of paramount importance. Being a working mom I must say that taking care of the skin should be a priority. I would like to try this one.